On 21 January, Serbia's Special Prosecution for Organized Crime and the Ministry of Justice took journalists to the special court on Ustančka Street where around 30 mostly luxury cars (Porsche, Audi, BMW) were parked out front. This was an effective way to show the media the results of the “Law for Confiscation of Property Deriving from Criminal Activity” in the first year of its enforcement. According to Prosecutor Miljko Radisaljevć and Minister Snežana Malović, seized goods include tens of millions of Euros worth of cars, drug money, villas, and land. Since the enactment of the law in March 2009, 21 financial investigations focusing on 208 people have been launched. “In reality, only one lot of land went through all the stages and became government property”, said Stevan Dojčinović of CIN (the Center for Investigative Reporting, linked to NUNS journalist association). “(The seized lot comprised) 20 hectares of land on Šilerova Street, worth 1.2 million Euros, and belonged to the two deceased leaders of the Zemun clan,” Dojčinović told Osservatorio Balcani e Caucaso. The former owners are Dušan Spasojević, known as 'Šiptar' [a disparaging term for an Albanian, translator’s note], and Mile Luković, called 'Kum' [Godfather], who were found guilty, together with Milorad Ulemek Legija, of contracting and organizing the assassination of Prime Minister Zoran Đjinđjić on 12 March 2003. The two were killed in a shoot-out with the police during “Operation Sablja [Sword]” which followed the murder of the prime minister. On 24 December, the seized land parcel on Šilerova Street was given to the Zemun municipal police and the new police headquarters will be built on the site. In June 2009, prosecutors determined that the first confiscation under the new law should be part of a house (178 square meters) owned by Milorad Ulemek Legija. Legija is the ex-chief of the Special Operations Unit (JSO), the armed guards of the secret services, and was convicted of Đjinđjić’s assassination. The confiscation has still not been carried out. According to the prosecution, the villa was bought with the ransom from the kidnapping of Vuk Bajrusević, brother of Bojan, a suspected cigarette smuggler. Ulemek’s wife, Aleksandra Ivanović, actually managed to prove that she had the economic means to buy her part of the house, saving it from being impounded by the court. According to the Ministry of Justice, if the confiscation is confirmed, the space will house a new kindergarten. “By now, we know that the aim of organized crime is to acquire money and to use this money to buy power. In this sense, hurting the criminals’ finances is one of the most effective ways to fight mafias,” said Marco Bonabello, a legal consultant on organized crime for the OSCE (the Organization for Security and Cooperation in Europe). The OSCE worked with the Ministry of Justice and the Ministry of Interior in 2004 to produce legislation on confiscation of the property of organized crime networks. “Italy is a leader in this field with its Rognoni–La Torre Law, its investigative methods, and the work of the National Anti-Mafia Department (Direzione Nazionale Antimafia). There has been intensive cooperation between the Italian Anti-Mafia Department and the Serbian Ministry of Justice in recent years, and it has already started to yield results,” Bonabello told Osservatorio Balcani e Caucaso. The fight against organized crime in Serbia is only in the beginning stages. Italy has offered Belgrade relevant know-how, including legislation on confiscation of property, a policy of strict imprisonment of mafia members (similar to Italy's “41 Bis” prison restrictions for particular inmates, introduced in 1975), use of collaborators, coordination between prosecutor offices, as well as international and regional cooperation. With the fall of the regime in 2000, the government started to think about how to fight organized crime. The police made a list of active crime groups - the so-called ‘White Book” - with photos and names of bosses and the activities of the clans. This was an unofficial document produced in 2002 and the first step towards a more in-depth investigation. It identified the Zemun clan as the most powerful and most brutal clan. A law on “Organization and jurisdiction of government institutions for fighting organized crime” was enacted in the same year. The mafia reaction came in March 2003. In response to the new government measures, the bosses of the Zemun clan, together with their associates, decided to strike the heart of government institutions by killing Prime Minister Zoran Đjinđjić. 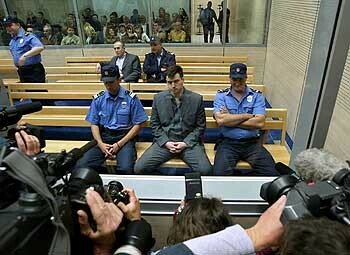 After Đjinđjić’s assassination, the government decided to settle scores with the Belgrade underground. To date, four of the most important trials initiated by the special prosecution have reached verdicts: Milorad Ulemek Legija and Zvezdan Jovanović (who fired the lethal bullet which killed the prime minister) were found guilty of the assassination of Prime Minister Đjinđjić and have been sentenced to a maximum punishment of 40 years imprisonment each. Other cases include the murder of Ivan Stambolić and the attempted assassination of Vuk Drasković (both in 2000), the prosecution of the members of the Zemun clan for crimes ranging from murders, robberies, and terrorist assassinations, and a second attempt to take the life of Drasković in which four other people were killed. As a matter of fact, crime in Serbia seems more internationally connected than ever, as recent police operations have revealed. The first operation, called “Balkan Warrior”, resulted in the seizure of 2.8 tons of cocaine imported to Europe from Columbia by Serbian “cells”. According to journalist analyses, the Serbian-Montenegrin mafia apparently acts as a very effective middleman in international cocaine trafficking thanks to links between the Balkan and South American mafias. On the other hand, there are the tycoons of the “do not ask me how I made my first million” type (as the saying goes in Serbia) who are very difficult to get because of lack of evidence, either because over the years they have become legitimate or because of lack of political will. But it is exactly this kind of criminal that is the problem in Serbia, our sources say, because they have been taking part in privatizations and causing a lot of economic damage. Furthermore, entry into the European Union does not represent an advantage for them. On the contrary.